Video marketing is becoming more widespread with enterprising businesses, which are building a brand, setting themselves apart from their competitors, and reaching their ideal customers. At Symbol Syndication we’ve had the opportunity to do videography for an incredible variety of businesses, both in Calgary and internationally. Many of these enterprises come to us knowing exactly what they want in terms of video production, while others come looking for ideas on how they can leverage video. Through our many projects in various industries, we’ve experienced an incredible diversity of strategies, applications, and uses of video, primarily in marketing. Here are several ways you can leverage video to grow your business. Some will be applicable, while others will not. We always recommend having a video on the homepage of your website that explains briefly what your product or service is, why you do what you do, and what problem it solves for your customer. These points are the backbone of good marketing. 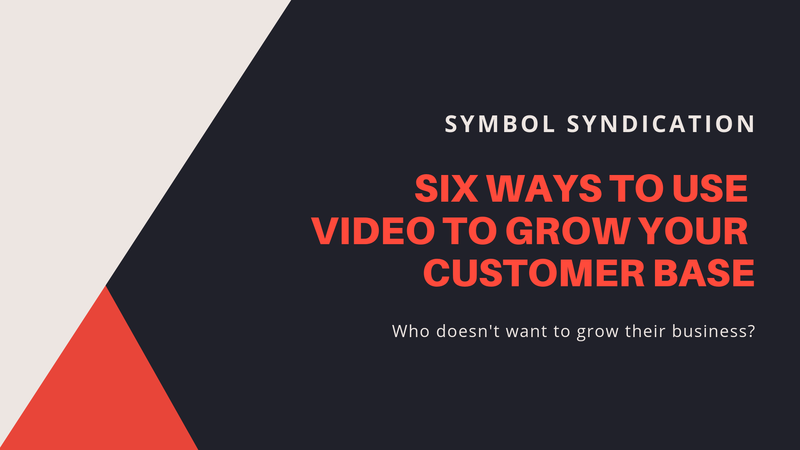 You want to make sure this video tells the story of your brand, as that will increase customer loyalty and make potential customers more likely to buy from you. This video will help people engage with your brand and it will build trust. A video like this can prevent customer confusion about what you do. An ideal length for the introduction video is typically 1.5 minutes long. Videos targeting commonly asked questions in your industry can have two primary benefits. The first benefit is that they provide value to your potential customers and position you as an expert in your industry. If potential customers see you’re providing value and see your expertise, they will be more likely to trust you and thus, more likely to buy from you. The second benefit of commonly asked question videos comes in the form of content marketing. Because YouTube is owned by Google, Google often gives preference to YouTube videos over other types of content. This means that if a potential customer is looking for an answer to a question, you’ll have a greater chance of being found because you’re answering that question. We have a specific strategy behind producing and implementing content marketing like this. Contact us for more information. Customer testimonial videos are an excellent way to show off why you’re awesome, build trust, and provide social proof of your product or service. Live videos on social media are often underutilized. People typically stream them from a smartphone, so the cost to do these is practically nothing. It’s amazing what can be done with Facebook/Instagram and YouTube Advertising. You can hyper-target locations and demographics, target your competitor’s followers, re-target people who have visited your website or Facebook page, and even target people similar to the people on your mailing list. The cost of Facebook and Instagram ads are also typically VERY low compared to traditional advertising, such as TV or Radio. We’ve had spectacular results with ads run for clients in multiple industries and areas. If you would like some ideas on how you can utilize video ads, please drop us a line. Some of the most successful videos we’ve made for clients have been humorous, poking fun at themselves or a spoof on something. Funny videos do well because people want to be entertained. If you can entertain while informing potential clients about your brand, your videos are much more likely to be enjoyed, shared, and not skipped like a lot of videos made solely for the purpose of being ads. Ryan Reynolds videos for Aviation Gin are an excellent example of this. If you found this article on video marketing helpful, please give it a share and leave us feedback on what you would like us to write about in the future. Jon Hafichuk is the owner of Symbol Syndication and has a background in establishing and leading marketing initiatives for several enterprises. He has experience providing services to businesses of all sizes, from solopreneurs to Global 500 companies.